WITH VIDEO FROM THE TRIAL: Confessed Norwegian terrorist Anders Behring Breivik showed predictable disregard for the Norwegian court system when his trial began on Monday, leading off with a clenched-fist extremist salute and objecting to the court’s legitimacy. Many of those involved otherwise praised the “quiet, dignified” nature of proceedings on opening day, while Breivik showed no emotion when forced to listen to the details of all 77 of the murders he committed last summer. Breivik, well-groomed and wearing a dark suit and tie, was handcuffed when he entered the Oslo City Court Monday morning. Police removed his handcuffs just before the trial began, and Breivik immediately made an extremist salute to those assembled in the packed courtroom. 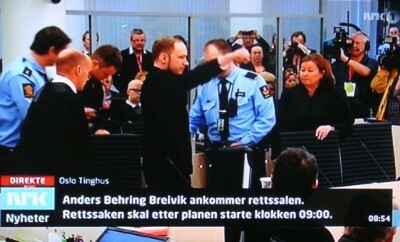 When the court took a break, Breivik refused to stand when the judicial panel hearing his case left the courtroom. Judge Wenche Elizabeth Arntzen began by introducing the prosecution and defense counsel, the judiciary panel hearing the case (two professonal judges including herself, three lay judges and two reserve lay judges), the court-appointed psychiatrists and, finally, the defendant. Breivik immediately objected, saying he did not recognize the legitimacy of the court because its “mandate” comes from “political parties that support multi-culturalism” in Norway. 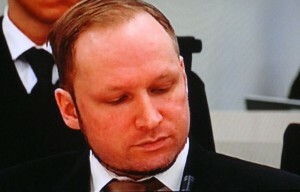 Breivik formally identified himself by name and birthdate and corrected Arntzen when she suggested he was unemployed. He claimed he was a skribent (writer) and was working from prison. Breivik also objected to Arntzen herself, claiming she is a “personal friend” of Hanne Harlem of the Labour Party, a former Norwegian justice minister and younger sister of former Labour Prime Minister Gro Harlem Brundtland. The party and Norway’s Labour-led government were Breivik’s foremost targets when he bombed government headquarters and carried out a massacre at Labour’s youth summer camp on July 22. Breivik’s objections were, however, deemed “informal” by his own defense counsel and thus merely taken under advisement by the court. He then had to listen, along with everyone else, to the formal reading of the charges against him. It took prosecutor Inga Bejer Engh nearly 90 minutes to name all 77 of his victims, where they were when attacked, and how they died. While some family members of the victims quietly cried in their seats inside the courtroom, Breivik showed no emotion, refusing to look at the prosecutor as she spoke and demonstrably fixing his gaze on the table in front of him. When asked by Arntzen whether he would plead guilty to all or any of the charges, Breivik responded by saying he acknowledged the factual evidence but declared himself innocent of punishable crimes, adding that he acted out of necessity and could justify his attacks. Breivik will be allowed to defend and explain his attacks over the next five days starting on Tuesday. Many Norwegians, including the head of the Labour youth organization AUF and the spokesman for a victims’ group, have complained that Breivik will be given a public platform to spread his anti-Muslim ideology. Others, from legal experts to Prime Minister Jens Stoltenberg, agree that Breivik’s testimony will be difficult to hear but that it’s “absolutely necessary” he be accorded the same rights as all other criminal defendants in the Norwegian legal system. It continued Monday with introductory remarks by the prosecution and defense counsel, including an overview of the events of July 22 and an overview of Breivik’s life from 1995 to 2006 and then from 2006 to 2011. The trial is scheduled to run until June 22.